Note that when the screen opens, 'Reason' (reason for Maintenance), 'Date Work Completed', 'Reset Schedule' and 'Work Completed By' fields are pre-filled. If the maintenance is not planned and/or not carried out on todays date, the schedule is not to be reset (see 'Reset Schedule' below), or the work has been completed by someone else, tap on the field and edit the fields accordingly. The maintenance history, task to be completed to close the Work Order and the maintenance item schedule can, if required, be viewed from the previous Task screen by tapping the close icon, top right of dialog screen. Depending on the users permissions level, this item could also be added to a docking/out of service repair list by clicking on the 'Docking List' button. If the item is already on the list, the item would then be displayed for editing. If a Service Report has been received and is in the appropriate format, this can be uploaded whilst closing the Work Order. The report will only be saved if the Work Order is closed. Home --> Maintenance --> Documents --> Upload allows for all documentation to be uploaded and assigned as required. Notes can also be added from the Close screen. The notes are independent from the Maintenance Item being closed and is most often utilised for passing on information to colleagues. This field is set to 'Yes' by default. In other words, the maintenance schedule will be reset when the Work Order is closed. There could be occasions where the schedule should not be reset e.g. (a) The maintenance item is to be deferred but a Work Order number has already been assigned. In this situation the Work Order will first need to be closed before deferring is permitted. (b) The maintenance task has not been completed and there is a requirement to update the history of the item for reporting purposes or the person tasked with completing the item is unable to complete the task for whatever reason. 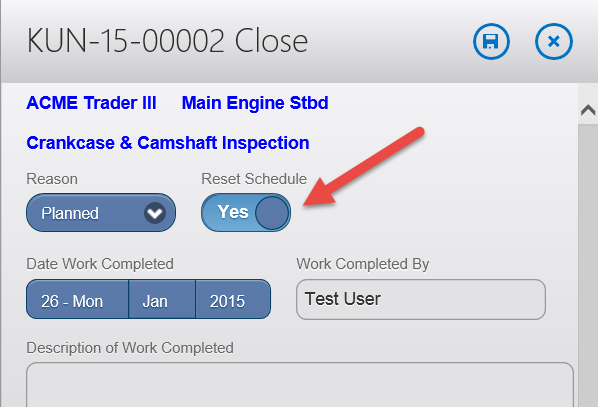 In this instance the Reset Schedule slider is to be moved to 'No' and the Work Order closed and a new Work Order then raised when in a position to complete the task.